Sundays during Sanfermin, at 6:45 a.m. Carlos Mediavilla finds a spot for himself at the fencing in Duque de Ahumada Street in order to try to get image that he has been imagining for some time. Because he knows that at about one hour later, it`s very likely that two sun beams will appear there and enhance the scene with a very special short-lived beam of light. Something like that has happened in this photo. Here, hundreds of runners may be seen, many of them regular runners on this stretch of the course, as they all rush forward towards the bull ring. Meanwhile, hundreds of other people look on from the balconies and fencing, getting their own dose of adrenalin from the whole scene. And, in among the packed crowd, the head of a bull looking as if it had a frightened gesture on its face. 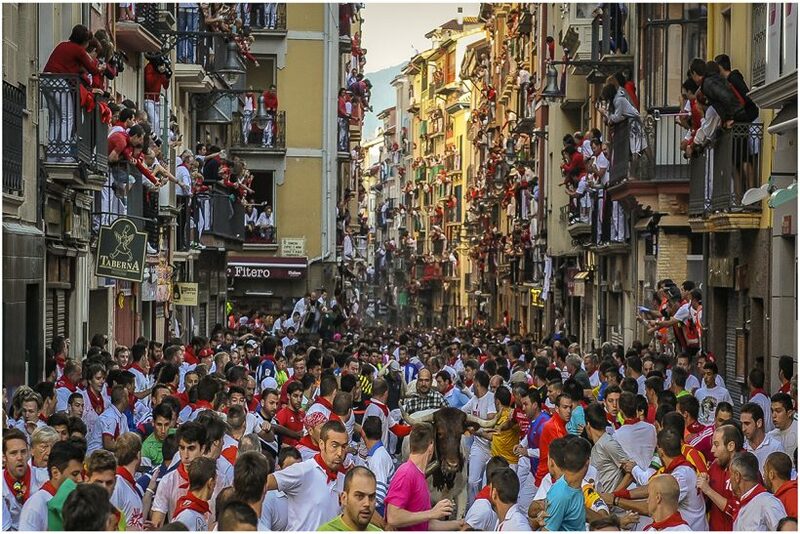 “For me, that photo is all about the look on the bull´s face, where it seems to be asking for space to breathe”, states Carlos Mediavilla, who have been collaborating with Sanfermin.com for some years now. And the fact is, although it may sound strange, the bulls can also feel pressurized and frightened during the Running of the Bulls event, especially when they get cut off from the pack and are running loose, as is the case in this photo. The story goes that, way back in time at some obscure date, the butcher’s tradesmen would accompany the drovers in their task of taking the bulls up to the bull ring. At first, they did so from behind or beside the drovers. But gradually some of these men began to run in front of the bulls to lead them up to the bull ring and this habit became more and more popular. In any case, don’t be fooled by this photo. If you fancy having a go at running with the bulls amid the packed crowd, just to try your luck in the Running of the Bulls event, first wise up on what it is all about. And, if you still feel like taking part, these pieces of advice will be very useful to you . What we would heartily recommend that you do is, at least once in your life, to watch the event live and the best place for that is from one of the many balconies which line the course. That would be a singular experience and maybe a nice gift to surprise someone special with. Here you can make a bona-fide balcony booking . You will be amazed.